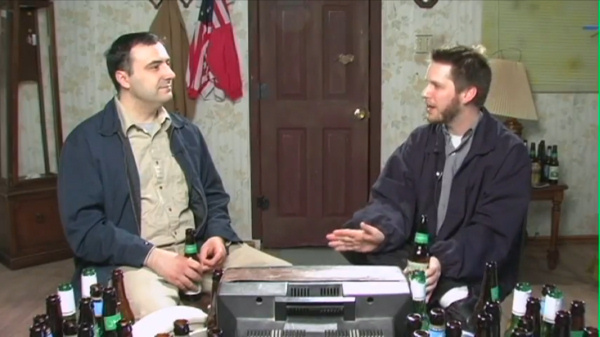 The folks at Red Letter Media — who brought us the infamous “Plinkett Reviews” of the Star Wars prequel trilogy (which are seventy, sixty, and one hundred ten minutes long, respectively) — have a regular web video series called Half in the Bag in which two VCR repairmen review both old and new videos. Each episode is about half an hour long and typically covers two movies, though a handful of episodes cover trips to various conventions (which are quite entertaining in their own right — especially the trip to the NoBrand Con). There are also humorous side stories dealing with the VCR repairmen characters and their job working for Mr. Plinkett himself. George Lucas (played by Rich Evans) even makes an appearance or two. If you like funny and insightful reviews of both good and bad movies, you’ll likely find these videos to be quite entertaining. A big thumbs up to Mike Stoklasa, Jay Bauman, and their crew! Keep up the great work! This entry was posted in TV & Movies, WWW and tagged half in the bag, movie reviews, red letter media. Bookmark the permalink.